On November 14, 1997, I was in Miami, Florida at Pro Player Stadium for my last PopMart show. Just like the show in Tampa a few days before, I again did not stay in my seat and stood right at the B stage. This time Smashmouth opened, who were not as exciting as Third Eye Blind was in Tampa. When U2 played their set on the B stage, Bono leaned into the audience with his leg up on the rail. I grabbed onto Bono’s leg, sort of hugged it actually. Although I have always been a Larry fan, I was really digging Bono during Popmart. Besides getting to hug his leg, I really liked how Bono looked on Popmart. His natural color hair was short, and he was in great shape. So yeah, I almost converted and became a Bono girl in November of 1997 – ALMOST! Don’t worry Larry, I still love you best! It was just a momentary lapse. I really enjoyed U2’s Popmart tour. I does not get the credit it deserves. Everyone always talks of PopMart as a failure because it did not sell out. But there were some great performances, and PopMart was visually pleasing as well. 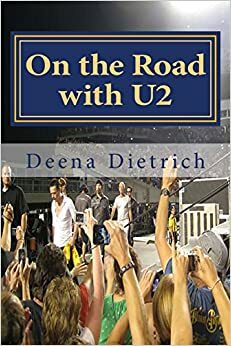 There was a giant golden arch like McDonald’s, a giant martini and a giant disco-ball traveling lemon that brought Larry, Bono, Edge and Adam to the B stage. And let’s not forget that exciting entrance when U2 walked through the crowd onto the b stage (where I was standing) and then to the main stage. PopMart was also the only time I have seen U2 in a uniform of sorts. They each had their own T-shirt: Bono was “Bono Man,” Larry was “Hit Man,” Adam was “Pop Tart,” and Edge was “Mr. the Edge.” I also think PopMart was the best U2 has looked as a whole, where each member of the band looked his best.